The list on environmental concerns continues to grow in the aftermath of the Sanchi tanker tragedy. Iranian tanker Sanchi sank in January after colliding with another vessel in the East China Sea, killing all 32 crew aboard and raising concerns about damage to the marine ecosystem. Multiple oil slicks were reported to have come from the ship, which was caring nearly 1 million barrels of condensate, and there are fears that the ship may be leaking heavy fuel oil. Now scientists say water polluted by the Sanchi oil tanker may reach coral reefs in the Ryukyu Island chain, based on the latest ocean model simulation by researchers from the National Oceanography Center (NOC) and the University of Southampton, using the leading edge, high-resolution global ocean circulation model, NEMO. These latest predictions have been made possible following new information about the suspected arrival of some of the oil from the Sanchi oil tanker at Amami-Oshima, an island at the edge of the East China Sea. This arrival underscores the critical importance of international monitoring to understand the spill, and reduce the uncertainty on its fate and ultimate impact on the region. 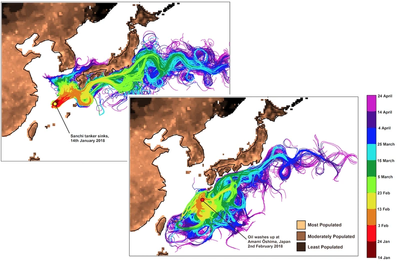 Previously, simulations by the same team of scientists were based on the Sanchi oil tanker’s final resting site, and found the proximity of the oil to the major Kuroshio Current significantly increased the potential area affected by the spill, including the Greater Tokyo Area, hundreds of miles away. They also predicted that the island of Amami-Oshima, home to 73,000 people as well as coral reefs, would be threatened by oil contamination approximately 20-30 days after the Sanchi sank. Now, after only 20 days, oil contamination has reached the island and prompted these revised projections. While these new simulations focus only on the fraction of the pollution that has reached Amami-Oshima, they find that refining the pathway of the spill actually extends the potential region of impacts. Previously only regions to the north and east of the Sanchi wreck were predicted to be affected, but these latest simulations point towards impacts on the Ryukyu Island chain to the south and west, with a small risk of contamination reaching the vicinity of Taiwan. The team of scientists involved in this study ‘dropped’ virtual oil particles into the NEMO ocean model and tracked where they ended up over a three-month period. Simulations were run for a series of scenarios of ocean circulation typical for the area the oil spill occurred in, and for this time of year. This allowed the scientists to produce a map of the potential extent of the oil spill, showing the risk of oil pollutants reaching a particular part of the ocean. 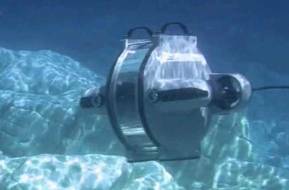 The NEMO ocean model is supported by U.K. National Capability funding from the Natural Environment Research Council (NERC). This model is widely used by both U.K. and international groups for research into ocean circulation, climate and marine ecosystems, and operationally as part of the U.K. Met Office’s weather forecasting.